A tree fell on this hose during a recent storm. The tree fell on the back side of this home causing all kinds of damage. 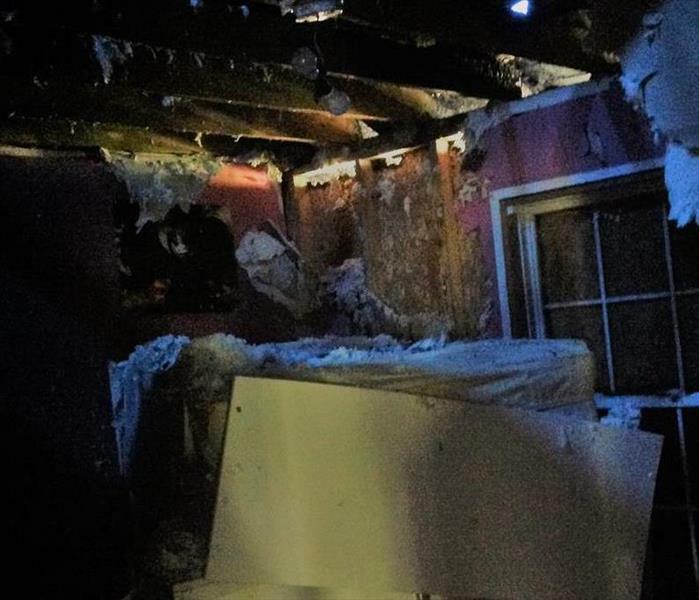 The back bedroom, bathroom and dining room received the most damage. All three rooms had to be demoed and dried out with dehues and air movers. Once all was dry the crew sprayed anti-microbial and the reconstruction was ready to begin. "Faster to any size disaster." When storms blow in water just seems to find a way to get in. This customer found water coming in through his crawl space which found it's way to a finished basement. For this customer all that had to be done was place some dehues and air scrubbers which allowed our crew to dry in place. After drying was completed our crew sprayed anti-microbial to finish the job. "Like it never even happened." This fire started in the front of the house in the bushes. The most affected areas were the two front bedrooms and garage. Most of the demolition was to the front two bedrooms, garage master bedroom and bath, along with hallway and front entryway. Once demo was completed our crew placed dehues, air movers and fogged with high volume deodorizer. The crew also removed all the unsalvageable content. Our crew had this house ready for reconstruction in 10 days. This family was happy that our crew finished this so quickly. Unexpected storm during roofing process. This customer was just having some roof work done when a sudden storm came in and damaged their home. Roofer did not secure the roof before storm arrived. The storm soaked all the insulation in attic. Ceiling damage to kitchen, bathroom, bedroom on upper floor along with bathroom and the garage. Our crew used the Injecte Dri System to dry out the drywall that was salvageable, removed all the insulation in the attic. We made it "Like it never even happened." This homeowner found cracks in her foundation of her finished basement. SERVRPRO of Harrisonville/Belton/Raymore called to this home when mold was found on wood paneling and under flooring. Our crew removed the paneling and the flooring after cleaning an antimicrobial was sprayed over the entire basement. The owners of this home were out of town during the Mid-West Freeze. 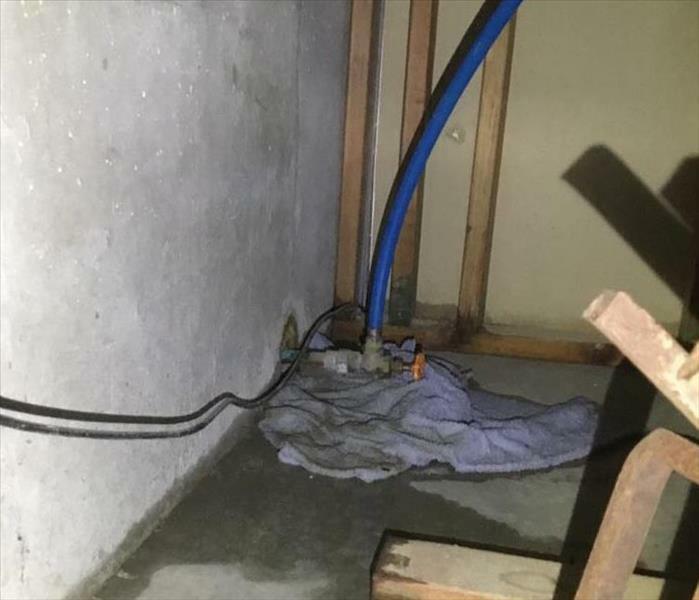 A water line to the upstairs bathroom froze and burst send water down all three levels and running out from under the garage door, that's when a neighbor noticed and called for help. Our crew got this family back in their me "Like it never even happened." Our crew was called to this vacant house which had water come through basement window for a long period of time. Once our crew arrived they began to remove all content, plus carpet and baseboard on the upper level. Basement was cleaned and treated with antimicrobial as was the upper level. SERVPRO of Harrisonville/Belton/Raymore was called to this home that had water damage that was not properly mitigated which cause mold to damage basement of this home. Our crew pulled all the soft content out, wipe it all down antimicrobial. After cleaning was completed the paneling and door jams had to be removed. A duct cleaning was performed along with a hepa vac cleaning. To finish the mold remediation the basement was sprayed with antimicrobial over the entire area. Our crew was called to this garage fire cause by a faulty breaker in the electrical box. the fire was contained to the lower level of this split level home, but the owner put fire out with fire extinguisher with door to upper level opened causing cross contaminating the upper level. Cleaned all content on site and stored in container until garage was completely clean and deodorized. Our crew did a light cleaning, deodorizing and carpet cleaning on the upper level cause by the fire extinguisher. Garage Fire being Thermal Fogged. This fire started in the garage and was contained to the garage. All the content had to be removed and all salvageable content was cleaned. Next our crew began cleaning the walls with Wall N Wall and SERVPRO orange. 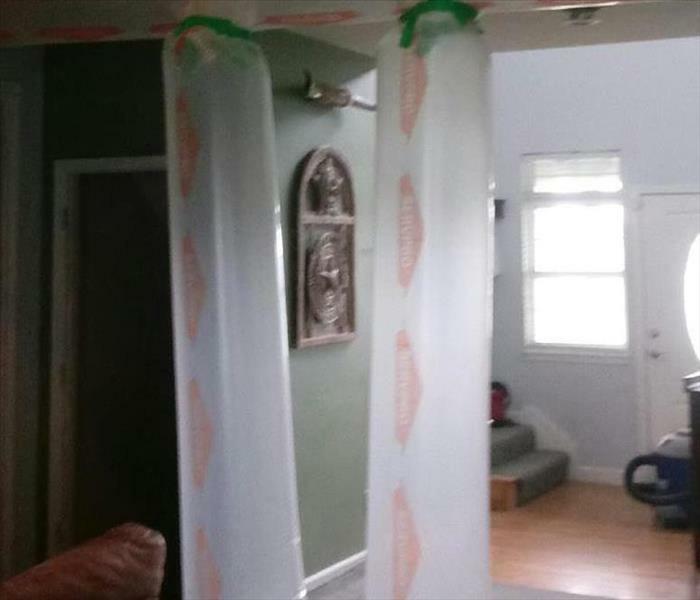 The popcorn ceiling was removed due to smoke and soot damage, after this cleaning was completed thermal fogging was performed to deodorize and eliminate the smoke smell. SERVPRO of Harrisonville/Belton/Raymore was called to an assisted living facility due to a sewer backup due to a clogged drain that came up thru shower and toilet. A negative air system was used along with air scrubbers to filter the air. A 2 foot drywall cut was done to all affected drywall. Our crew then proceeded to flush the areas, then used dehumidifiers and air scrubbers to dry the area. 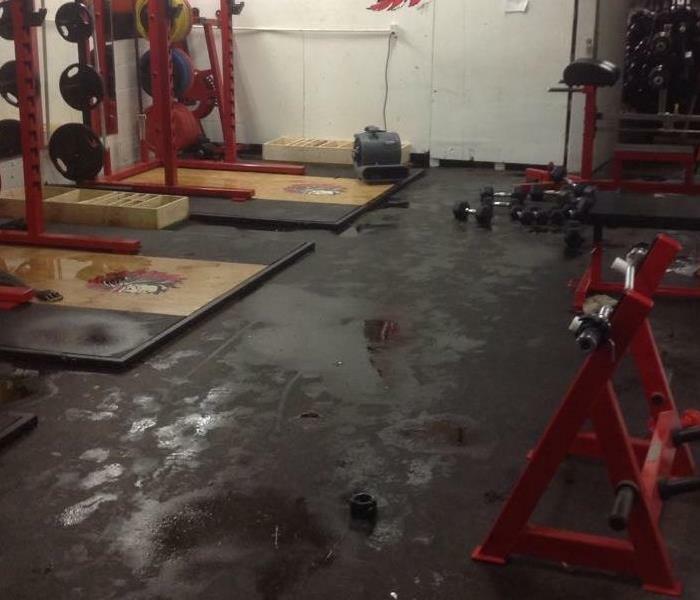 A sump pump failure caused a flooded athletic room in a local school which was located on the basement level. SERVPRO of Harrisonville/Belton/Raymore arrived and began extracting the water so the crew could begin removing content such as glued down mates,weights and other athletic gear and equipment. Once area was cleared our crew set up 4 dehumidifiers and about 15 air movers to get this school back on track. Broken Water Line on Weekend House. A water line broke on the main level on this weekend house. The owner did not find out until about three weeks later and the mold was pretty bad. When our crew arrived the proceeded to contain the areas and begin to remove all affected content and remove the flooring and drywall, cabinets. The crew ran air scrubbers and sprayed antimicrobial. The owner of the property is very happy the our crew was very efficient with our services. SERVPRO of Harrisonville/Belton/Raymore was called to this duplex complex when a tenant put a smoking car in the garage then later discovered smoke coming into the duplex through garage door going into the duplex. Tenant opened door to find a massive blaze in the garage. Fire was put out quickly and the only structure damaged was the one with the burnt garage. Our crew ozone the adjoining property to insure no smokey smell would occur. Garage and upper bedroom had to be demolished and rebuilt. Cleaning and ozone with air scrubbers got this duplex back to good as new living conditions. 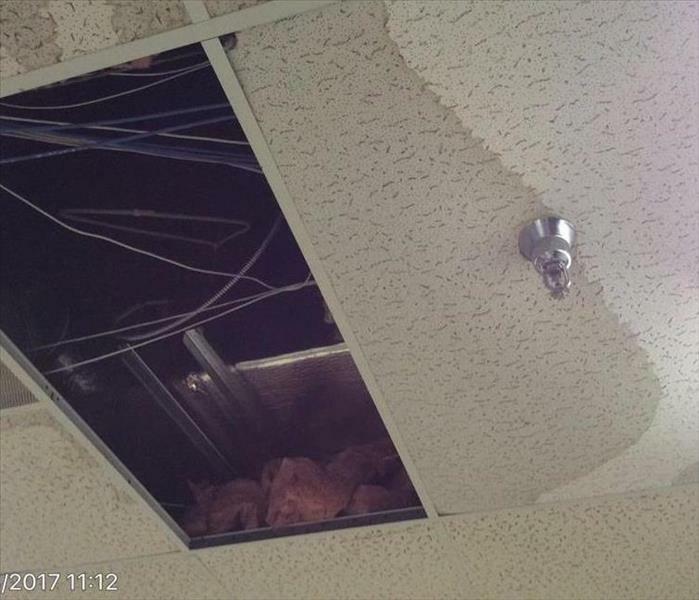 This business office in Lenexa, KS had water running in through the roof into the offices through the ceiling. Water was running in the light fixtures into the carpeted floor and was even on top of the desks. SERVPRO of Harrisonville/Belton/Raymore had this office space dried and cleaned up and ready for business in no time. Water was running in the doors of this local daycare center after heavy rains. Air movers and dehumidifiers were used to get this daycare up and running again. It didn't take long for SERVPRO of Harrisonville/Belton/Raymore to get the children back in their daycare center. This basement of a church pre-school was flooded due to heavy rains in the area. the basement was totally flooded. SERVPRO of Harrisonville/Belton/Raymore arrived and had the school area dry in 3 days and all of the content cleaned ready for the students to arrive, "Like it never even happened." 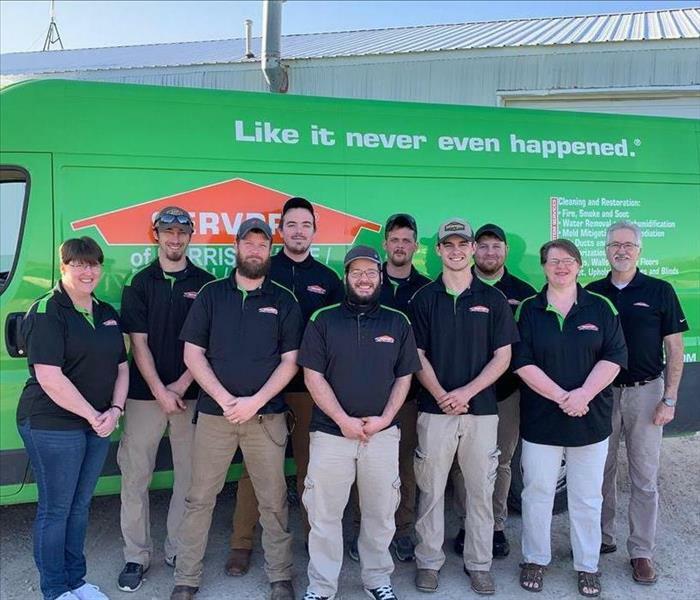 SERVPRO of Harrisonville/Belton/Raymore is here to serve you 24/7/365. We are growing in our services and will be there when you need us. Faster to any size disaster and we will make it "Like it never even happened." What a cool way to dry an upper floor. A leaky supply line on a second floor bathroom caused this catwalk floor to be wet. Using air movers with lay flat were used to dry the double wall plate on second floor catwalk, "Like it never even happened." 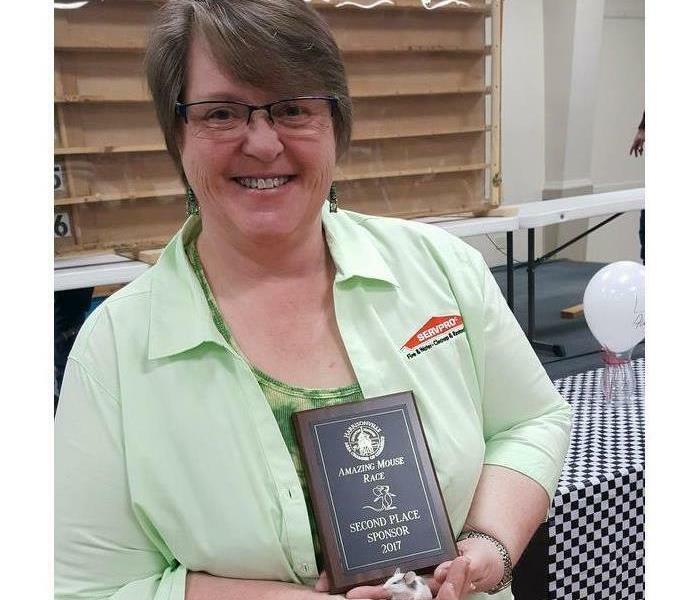 Our Mighty Mouse, Blaze, captured 2nd place at the 2017 Harrisonville Area Chamber of Commerce Mouse Races. Pictured with Blaze and trophy is Office Manager, Amy Bell. "Faster to any size disaster!" This is our Production Tech Devin Thompson operating a Dri Eaz Rover HVE on a water loss loss in a finished basement. SERVPRO Harrisonville/Belton/Raymore cleaned it up" Like it never even happened." 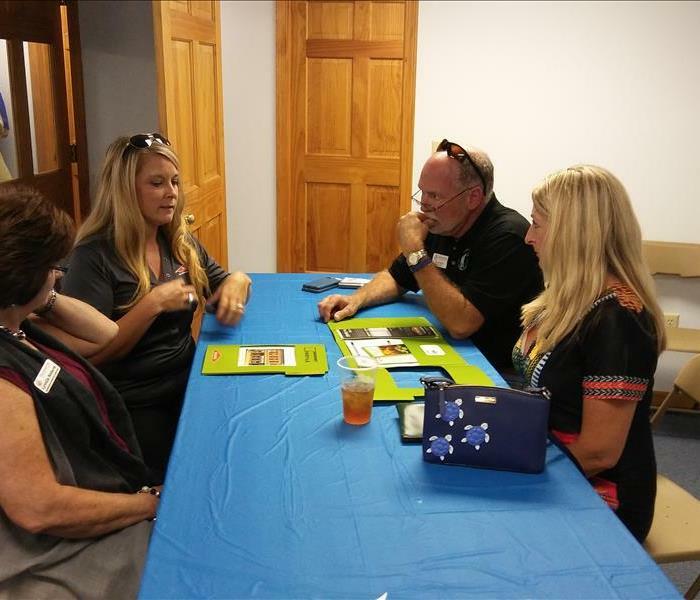 SERVPRO Marketing Representatives for Harrisonville/Belton/ Raymore can deliver an ERP for your facility. Here we are delivering the Harrrisonville Area Chamber of Commerce their new ERP (Emergency Ready Profile).This profile will help them learn more and be ready for whatever happens!